If Emerson wants to be a truly inclusive community, their policies need to have real-world effects. When I first began to look at Emerson College back in my junior year of high school, a big factor influencing my choice of school was the LGBTQ culture. I wanted to know what kind of community I would be entering if I attended, and I was thrilled to see that the school seemed to be more than welcoming to students of all sexualities and genders. It seemed that Emerson was a safe haven for students to express their identities and truly explore their sense of self. For me, this meant I could be open about my bisexuality and use of they/them pronouns without feeling like an outsider. For my friend and classmate Kyle Eber, a transgender freshman, it meant he could enter a new community and be seen for who he truly was—and that new beginning started with being called the right name. 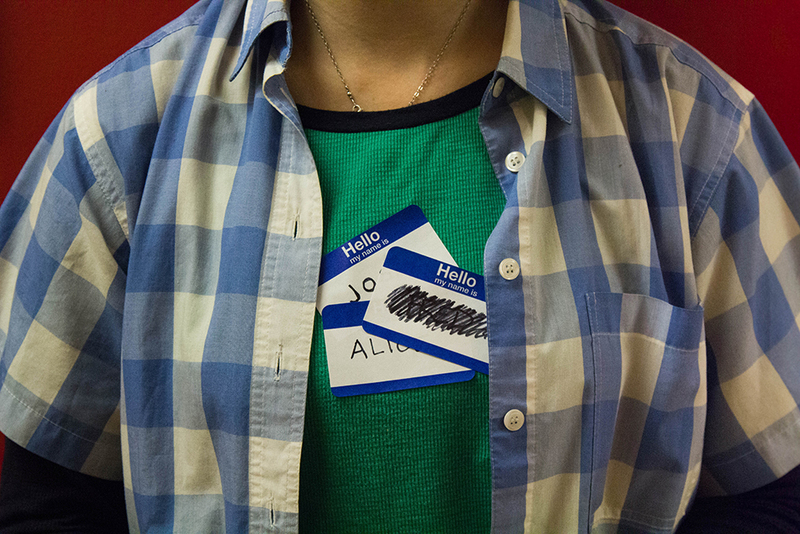 Referring to a transgender individual by their birth name, or “dead name,” can be upsetting and disturbing. Their identity is erased when they are referred to by the name that doesn’t reflect their gender, and it’s a hugely hurtful and invalidating experience. It is also a problem that was never supposed to happen in the first place. Incoming transgender freshmen have the opportunity to contact the school over the summer and request a name change to be reflected in their email address, their class listings, and their ID cards. A legal name change used to be required to change a student’s name on a diploma, but the Office of the Registrar changed that policy this summer so students’ diplomas can have their preferred name. As soon as he sent in his enrollment deposit in May, Eber contacted the school about changing the name on his ID and email address. He heard back from the school to let him know that his name would be updated in their records, but he said this change didn’t take effect for several months. It took several more email exchanges to finally get his name updated in eCommon, but the problem persisted even after he arrived at Emerson. “I’ve had a couple mix ups with teacher rosters,” he said. “I had to change my name on Canvas myself.” In two of Eber’s classes, the attendance list still had his dead name on it, and he had to let the teacher know that the name was incorrect. Some attendance lists are on paper for use each day, which presents a problem for students like Eber, who changed his name on these lists manually. “It’s an attendance sheet for the entire semester, so now people will see that and see a crossed-out, scribbled name,” Eber said. For another freshman, Chris Rohrer, the attendance list in all four of his classes had the wrong name listed, even though he had contacted the school over the summer and was assured the name change would be updated. When he got to school, it didn’t seem any of his professors had been informed. Another transgender freshman, Emily Lynch, had a similar experience trying to sign her parents into her building. Even though her ID is updated and has the correct the name, Lynch was asked to give her dead name to sign in guests. Tamia Jordan, director of Intercultural Student Affairs, said the computer system the school uses is very antiquated, and thus when students request name changes it doesn’t take effect everywhere. “There’s a committee that is working on resolving all of that,” Jordan said. She is also working on a new webpage for the Emerson website that will show the places legal names are required and the places preferred names will be shown. Currently, legal names for students are still kept on record in the computer system even if their preferred name is updated on attendance lists or as their display name in eCommon. At the heart of the database, students who have requested name changes are still logged under their birth name. For a school that prides itself on pride, this surface-level change is disheartening. Emerson College was recently ranked #3 in the nation by the Princeton Review under the category of “LGBTQ-Friendly.” While the methodology of these rankings relies completely on self-reporting students, it still holds significant weight. Vice President for Diversity and Inclusion Sylvia Spears said that this new ranking for the school might lead Emerson to feel secure in the school’s LGBTQ policies even though there is still a long way to go. For Eber, Rohrer, Lynch, and other incoming LGBTQ students, it’s concerning seeing the school promote itself as a safe space for students to be themselves, but not seeing that image reflected in Emerson’s policies and actions. Freshman Wyatt Regner had his name legally changed this past summer, yet all of his professors called out his birth name in class from their attendance lists. He tried to contact the Office of Intercultural Student Affairs to correct the issue but said he didn’t hear back for two weeks. Regner has dealt with the complications of name changes before, and understood that it was a long process, but still thought the situation wasn’t handled well. The discrepancy between what the school promises incoming transgender students and how they actually follow through on their marketed policies suggests that allyship is useful for promoting image and reputation. During Pride month, exploitation of the LGBTQ community is a disturbing trend. It’s insulting to members of the community that advertisers often only pander to us during Pride month. As LGBTQ equality becomes more acceptable, it also becomes more profitable; that is, companies that market themselves as being accepting are using this culture of acceptance to appeal to a new consumer base. To see this trend surfacing at our school is deeply concerning. While Emerson doesn’t advertise to the extent big companies do, we are still promoted as a school where LGBTQ culture and acceptance are an essential part of campus life. When performance doesn’t meet expectations, it seems like being accepting is just a marketing strategy rather than a moral philosophy. If Emerson wants to be a truly inclusive community, their policies need to have real-world effects. While the addition of gender-inclusive bathrooms last fall was a good first step, it’s only the beginning. A sign does not change the way students are treated in daily interactions, and the administration needs to do everything in its power can to validate the experience of all students. Appropriate recognition of gender and name changes is an entirely achievable goal at an institution of our size. For Eber, this problem leaves him wondering what his place is at Emerson, and what the future holds for him as a transgender student. Although plenty of freshmen encounter their own problems as they transition to a new school, what’s worrying for Eber and other transgender students is whether or not these instances were one-time mistakes or issues that they will have to deal with time and time again.